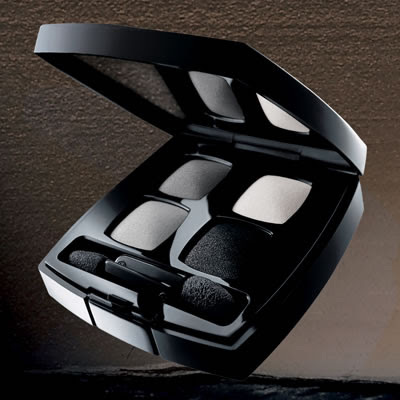 We are adoring the Chanel Les 4 Ombres Quadra Eye Shadow in Smokey Eyes ($56)...because it just oozes sexiness. From the sooty black shadow with the slight shimmer, to the may-jah dark gray that's just divine...everything about this quad is perfect. With the other colors...a gorgeous white and a lighter gray...you can go from a day to a night-time eye in a wink. It was easy to follow where to put everything...I used the white as a highlight color, the lighter grey on the lid and up to the crease, the darker grey lined both upper and lower lashlines and went up into the crease on the outside. The pigments are definitely rich...so use a light hand at first and add more if you need it. Pair it with their Le Crayon Kohl in Noir ($27) and their Exceptionnel de Chanel Mascara ($28) and you've got your perfect luxurious smokey eye look. In case you're like us and totally need a visual to do this look yourself...here's a tutorial we found on You Tube that delivers a perfect evening smokey eye. One last thing...to keep it really chic, we'd pair this eye look with a lighter lip. If you want to stick with Chanel (and really...who wouldn't) we'd go with Chanel Glossimer in Seashell ($26) a really fabulous very light peachy-gold that's just about flattering on everyone. It's gorgeous. Not only for creating the perfect smoky eye but also, it just looks so chic and glamorous on its own! really liked it. i would wear that during that day as it wasn't as dark as it could be. also, i have never seen a make up artist start by lining the bottom first.